The Southern Ocean, climate change and the future of the Antarctic ice sheet: A soft underbelly in East Antarctica? By soaking up heat and carbon dioxide from the atmosphere, the ocean slows the rate of climate change. In fact, global warming is really ocean warming: about 93% of the extra heat stored by the Earth over the past fifty years is found in the ocean. Of particular importance is the Southern Ocean, where ocean currents efficiently transfer water, heat and carbon between the sea surface and the deep sea. Given the strong influence of the region on climate, changes in the Southern Ocean would have widespread consequences. Measurements from ships and robotic floats show that significant changes are already underway: the Southern Ocean is warming, freshening and becoming more acidic. In addition, evidence is growing that the Antarctic Ice Sheet is vulnerable to change in the surrounding oceans. A recent Australian expedition, the first to reach the Totten Glacier, suggests the East Antarctic Ice Sheet is likely more sensitive to ocean warming than previously thought. This lecture will review recent progress in understanding the role of the Southern Ocean in the earth’s climate system, how the Southern Ocean is changing, and the consequences of those changes for climate, sea level and the future of the Antarctic Ice Sheet. Dr Steve Rintoul is a CSIRO Fellow at the CSIRO Oceans & Atmosphere Flagship and the Antarctic Climate and Ecosystems Cooperative Research Centre in Hobart. 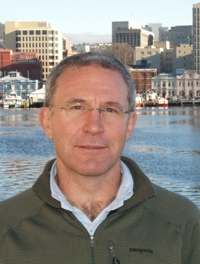 His research is focused on the role of the ocean in the climate system. He has a particular fascination for the Southern Ocean, where his work has led to a deeper appreciation of the influence of the region on global climate, biogeochemical cycles and biological productivity. He has led 12 expeditions to Antarctica and coordinated the major international Southern Ocean climate research programs conducted over the past 25 years. Dr Rintoul was a Coordinating Lead Author for the 5th Assessment of the Intergovernmental Panel on Climate Change. His scientific achievements have been recognised by many national and international awards, including the Georg Wüst Prize, the Martha T. Muse Prize, the Australian Antarctic Medal, and election as a Fellow of the Australian Academy of Science.